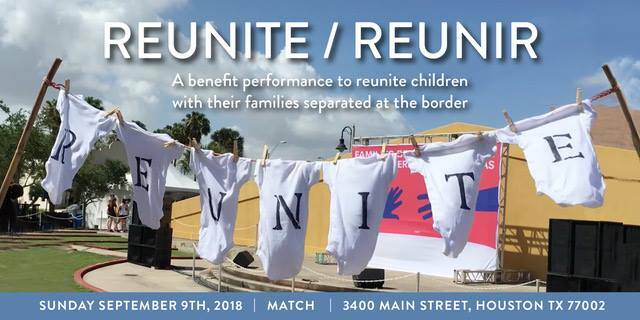 HOUSTON, TX – An impressive collection of Houston’s professional performing arts groups, which are no stranger to responding to humanitarian needs through their creative resources, are joining forces to host “Reunite/Reunir: A Benefit Performance for Separated Families” on Sunday, Sept. 9 from 4 – 7 pm, at Midtown Arts and Theater Center Houston (MATCH, 3400 Main Street, Houston, TX 77002). One hundred percent of the proceeds will support programs administered by nonprofit Texas Civil Rights Project (TCRP), which works diligently to reunite families displaced as a result of immigration policies. “As a Latina and now a mother, it is an honor to share a bit of my art and bring some joy to so many young innocent hearts,” said Venezuela native Karina González, Principal Dancer with Houston Ballet who will perform at the benefit. The event will be organized into a total of four 60-minute shows – two performances at 4 pm and two performances at 6 pm. Attendees will be required to select one of the two shows during each time slot. Tickets to the show will be based on donations to TCRP. For a $50 donation, attendees can select from one of the four shows. A donation of $100 to TCRP will give attendees entrance to two of the four shows. The line up for each of the performances will be announced soon. The event will be emceed by a collection of well-known Houston talent including local actor / director Justin Doran, actress Carolyn Johnson, Houston Ballet soloist Harper Watters and Susan Blair of Art Saves Lives. Lighting designers are David Deveau and Tiffany Schrepferman. Between shows, the plaza at MATCH will feature a festival-like energy with art, music and food trucks. “Reunite/Reunir” aims to raise more than $50,000 to benefit Texas Civil Rights Project, which provides free legal counsel to parents separated from their children at the border. It’s estimated that 500-600 children remain separated from their families. Representatives from Texas Civil Rights Project will be in attendance at the performances to discuss the organization’s ongoing work and critical needs. Event info: http://bit.ly/ReunirBenefit. Line up for each program will be announced soon. Tickets: One ticket to one of four programs (one at 4 pm OR one at 6 pm) requires a $50 donation to Texas Civil Rights Project; for tickets to two programs (one at 4 pm AND one at 6 pm), a $100 donation will be required. Donation receipt serves as admission ticket. Interviews in English and Spanish are available upon request. To coordinate, please contact Monica Rhodes at monica@monicarhodes.com or 979-285-8512.